Aloe vera juice is a healthy drink that is good for your digestion, reducing gastric inflammation, and keeping your heart healthy. Aloe vera is a well-researched succulent plant that contains vitamins, minerals, amino acids, and beneficial enzymes. Most of the health benefits of aloe vera are in the nutrient-rich flesh of the leaf. Aloe juice is made by crushing the whole leaf to extract its content. The best kind of aloe vera juice to buy is the unsweetened kind with as few additives as possible. Many people say that the aloe water has a refreshing taste with bitter overtones. For some people, drinking aloe vera juice is an acquired taste. However, one thing is certain: drinking aloe juice is very good for your health. In this article, you will find out what scientific research has revealed as to the health benefits of drinking aloe vera juice. You will also learn if there are any side effects of taking aloe vera internally. What Is Aloe Vera Juice (Aloe Juice)? Aloe vera juice is an extract from the leaf of the aloe vera plant which grows in hot tropical and dry climates. Aloe vera (Aloe barbadensis) leaves contain a gooey gel that is well-known for its many medicinal properties. Research into the benefits of aloe vera gel (the substance from which aloe juice is made) shows that it is good for killing off bacterial infections, soothing gastrointestinal issues, relieving constipation, and boosting the immune system. Although there are around 400 Aloe species, the Aloe Vera variety is the most potent when it comes to its medicinal properties. Researchers have identified over 75 bioactive compounds in aloe vera gel that include enzymes, vitamins, minerals, organic acids, and antioxidants. Natural aloe vera juice is rich in nutrients making it an extremely healthy drink that you can enjoy any time of the day. A quick examination of the nutritional content of aloe vera gel shows just how beneficial drinking aloe water can be. Taking aloe vera gel extracts internally is good for your overall health because they contain vitamins A, C, and E as well as B-group vitamins. These are powerful antioxidants and vitamins necessary for good skin health, vision, cardiovascular health, and to reduce the effects of oxidative stress. Another reason why drinking aloe juice is beneficial for you is that it contains important minerals that help improve internal organ and bone health. For example, aloe vera contains magnesium, potassium, copper, calcium, manganese, and selenium. Drinking aloe water is good for you because it contains 7 out of the 9 essential amino acids, as well as many nonessential amino acids. Research has also revealed that compounds in aloe vera gel have anti-inflammatory, antimicrobial, antiseptic, and analgesic properties. Some scientific research has also identified other compounds in aloe vera leaf that make drinking aloe juice therapeutic. Aloe vera extracts are rich in polysaccharides. These are carbohydrates that work with other compounds in aloe vera liquid to increase its medicinal benefits. Many people claim that drinking aloe vera juice can help in losing weight and reducing your waistline. Is there any substance to claims that aloe vera is good for weight loss? Pure, natural aloe vera juice contains vitamins and minerals. Aloe juice also has a laxative effect. The laxative effect of drinking aloe vera juice is the reason why some people claim that aloe juice helps to lose weight. However, laxatives are not recommended for losing weight as they can make you dehydrated and malnourished. Doctors from the Mayo Clinic also say that long-term use of large amounts of aloe vera as a laxative can lead to abdominal cramping and diarrhea. So, when should you drink aloe vera juice for weight loss? The answer is that aloe vera juice itself won’t help you lose weight. In fact, some commercial types of aloe vera juice contain a lot of sugar and additives that may actually cause weight gain. If you think that aloe vera juice may assist in losing weight, make sure and buy the unsweetened variety that doesn’t contain flavors or thickeners. It is also important to follow the manufacturer’s instructions as to the amount you need to dilute pure aloe vera gel before drinking. Consuming aloe vera juice while dieting can give your body important minerals, vitamins, and amino acids that help improve your metabolism. Let’s look in more detail at why you should drink aloe vera juice to help address many health concerns. Drinking aloe vera juice on an empty stomach may help to regulate and improve your digestion. Research published in the Journal of Research in Medicinal Sciences reported that drinking aloe vera juice can help relieve some symptoms of irritable bowel syndrome (IBS). Drinking 30 ml of aloe vera juice daily helped to relieve abdominal discomfort and excess gas in patients with IBS. There are a number of unsweetened, commercially produced aloe vera juice drinks that help support healthy digestion. Some of these preparations recommend drinking a tablespoon of aloe vera juice 3 times a day. You can also drink aloe water in conjunction with probiotics to help improve your digestive health. Researchers found that aloe vera acts as a prebiotic which encourages the growth of healthy probiotic bacteria in the gut. Scientific research suggests that drinking aloe water at a concentration of 5% is good for your digestion. There is another reason why consuming juice containing aloe vera is good for your digestion. Research published in 2015 found that aloe drink has an antibacterial effect in the gut. Aloe vera can help to kill off strains of E. coli and various Streptococcus bacterial infections. One of the well-documented benefits of aloe vera juice consumption is its ability to get your bowels moving better. Drinking aloe vera juice can help relieve the symptoms of constipation and improve stool frequency. Studies have shown that aloe vera extracts can increase water content in the large intestine which can affect the consistency of stool. It should be noted that long-term use of high doses of aloe vera drinks can cause diarrhea and even worsen constipation. Another study found that a combination of natural ingredients including aloe vera was an effective laxative for treating constipation. A preparation of psyllium, celandine, and aloe vera helped increase the number of bowel movements and softened stool. The anti-inflammatory effect of drinking aloe vera juice is also good for treating inflammation in your gut caused by gastric ulcers. Aloe vera gel from the plant leaf is well-documented for its ability to reduce inflammation as a topical preparation. However, the same enzymes in aloe vera drinks help protect your gastrointestinal lining. One study found that aloe vera has a gastroprotective effect when ingested because it helps inhibit the amount of gastric acid. This helped to reduce irritation in the gut and reduce gastric inflammatory responses. Drinking aloe vera juice first thing in the morning can help boost your immunity. An aloe vera gel drink contains healthy compounds that help to kill off infection-causing microbes and increase the number of healthy bacteria in your body. Researchers have also found that drinking aloe juice stimulates the body’s immune system. The benefits to your immunity from aloe vera water come from the polysaccharides in the gel. These beneficial carbohydrates help increase immune system activity and kill off free radicals that can cause oxidative damage in the body. Regularly drinking aloe water gives your body a large dose of antioxidants that help keep your cardiovascular system in good health. One trial found that aloe vera drinks are good for your heart because they help prevent a buildup of artery plaque (atherosclerosis). A trial involving mice found that consuming aloe vera leaf gel helped to prevent the development of fatty streaks when fed a high-fat diet. The researchers summarized that drinking aloe vera juice could help prevent atherosclerosis and prevent a buildup of fat in the blood. Drinking aloe vera juice may help protect the health of your liver due to its high levels of antioxidants. A medical study found that drinking aloe juice while undergoing radiation therapy can help protect liver and kidney tissues. Another scientific study found that consuming aloe drinks can help to prevent liver damage caused by alcohol. Drinking aloe juice as a health supplement could also improve the elasticity of your skin and prevent the formation of wrinkles. Aloe vera gel is a popular natural remedy for various skin issues like burns, wrinkles, and dry skin conditions. There is also evidence that taking aloe gel juice internally can nourish your skin from within. One study involving 30 women over the age of 45 found that consuming an aloe drink daily helped improve their skin’s appearance. The women consumed 1.2 g or 3.6 g of aloe vera gel for 3 months. After the 90-day period, researchers noted visible improvement in the appearance of wrinkles. Aloe vera supplementation helped to increase elasticity and collagen in the skin. One of the beneficial effects of an aloe vera drink is that aloe gel contains amino acids, minerals, and certain hormones that may help regulate thyroid activity. Research published in 2018 found that aloe vera juice can help to increase serum free thyroxine (FT4). 30 women with Hashimoto’s thyroiditis took 50 ml of aloe vera gel on an empty stomach. After a 9-month period, researchers noted that T4 and T3 thyroid hormones were normalized. The results of the aloe vera thyroid therapy were comparable to some traditional methods of treating an underactive thyroid. How Much Aloe Vera Juice Should You Drink Daily? You can drink aloe vera juice on an empty stomach; however, you should limit your intake to safe doses. Many of the studies in this article show that drinking no more than 50 to 100 ml (2 to 3.5 fl. oz.) daily is enough to benefit from aloe drinks. For example, one study on the effects of using aloe vera gel drinks to treat gastrointestinal problems in humans found that consuming 100 ml aloe vera juice daily had no adverse effects. If you need relief from constipation, you can drink larger doses of aloe vera on a short-term basis. You may want to try drinking between 100 ml and 200 ml of aloe water for a few days to help soften stool to make it easier to pass. It has been suggested that you should always buy aloe vera juice that is free of aloin. Aloin is a compound that is found in between the outer leaf of the aloe plant and the sticky gel inside and has been connected to colorectal cancer in rats. Unfortunately, often the label does not give the information if a product contains aloin or other anthraquinones (this is a laxative that can have adverse effects). The study alerting the public to the possible carcinogenicity of aloin was performed by the U.S. Drug and Food Administration and published in 2013 in the journal Toxicological Sciences. However, some experts disputed the findings and pointed out that the study included aloe vera products that are completely different from aloe vera juice products on the market. For example, the products used in the study, contained 6,300 ppm (parts per million) of aloin, while the commercially sold juices usually contain a maximum of 5 ppm aloin. The industry’s standard is less than 10 ppm of aloin in aloe products for oral consumption. Also, other studies showed no significant toxicological effect from ingestion of aloe vera, as reported by Alexander Schauss, PhD, senior research director at AIBMR Life Sciences. The general recommendation is not to drink aloe vera juice for prolonged periods of time, unless it is free of aloin. Also, due to lack of evidence about its safety, aloe vera products should not be used orally (by mouth) by children and pregnant women. Most agree that at low dosage and when used according to instructions, aloe vera is a great healing plant that can help you maintain your health. Just make sure to consume high quality products, and follow the manufacturer’s recommendations. 1. Cut a few leaves of aloe vera plant. Wash them and pat dry with a towel. 2. Cut the edges of the aloe vera leaves with a knife and discard. Then cut the rind from the front and back of the leaves and discard as well. You can also use a peeler to do that. 3. Discard the yellow-green gel that is just under the rind so you are only left with the clear gel. 4. Store the clear gel in a clean jar in the refrigerator. 5. When you want to drink aloe vera juice, take 2 tablespoons of the aloe vera gel, put in a blender and add a cup of juice, smoothie, coconut water, or plain water with honey. Blend together until you have a smooth consistency. Then drink. Researchers warn that drinking larger doses of aloe vera on a long-term basis can actually cause constipation and abdominal cramps. Doctors from the Mayo Clinic warn that high doses of aloe vera gel can lead to various complications. A large dose of aloe vera gel is 1,000 mg of pure extract daily. This can affect kidney health, cause diarrhea, or interfere with certain diabetes or anticoagulant drugs. It is good to remember that aloe vera juice drinks contain a much less concentration of aloe vera gel. 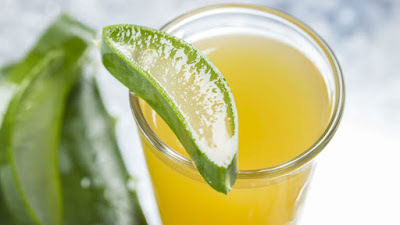 In fact, if you want to make your own aloe vera drink using commercially-bought aloe vera gel, you usually just need a capsule of aloe vera juice to mix with a glass of water or juice. Aloe vera can interact with prescription drugs and over-the-counter medications, so you should inform yourself of the possible interactions before drinking the juice. For example, the juice can increase the effect of some diabetes medications and cause potassium loss if taken with some heart medications.